LISCO sideline makers are designed for durability and stability. 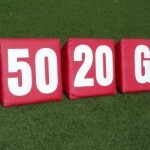 Each marker is oversized at 18” x 18” x 18” and is made using 18 oz coated vinyl with a solid foam core. The bottom is weighted to keep the marker in place. 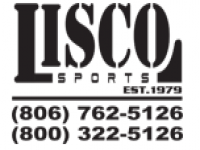 All LISCO step over pads are constructed using a lightweight solid foam core and 18 oz coated vinyl. The double stitched handle is made from seatbelt webbing. Most school colors are available.